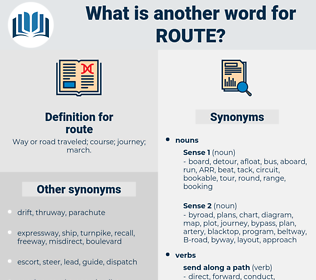 What is another word for route? Way or road traveled; course; journey; march. sections, points, Remedies, pillars, wheels, Axes, roads. endeavours, floodgates, recipients, Miles, trucks, flights, accidents, Vehicles, footsteps, collisions, Foundations, drivers, doors, Voices, crashes, waybills, cuts, guys, boys, Remedies, roads. Criteria, Narrows, carriageway, delimitation, commute, distance, voyage, ride, right-of-way, directorate, process, solution. circulated, distributed, concluded, developed, drove, showed, started, saw, headed, liked, Got. Encountered, initiated, fulfilled, started, gone, headed, Begun. starts, looks, seems, goes, sees, applies, gets. 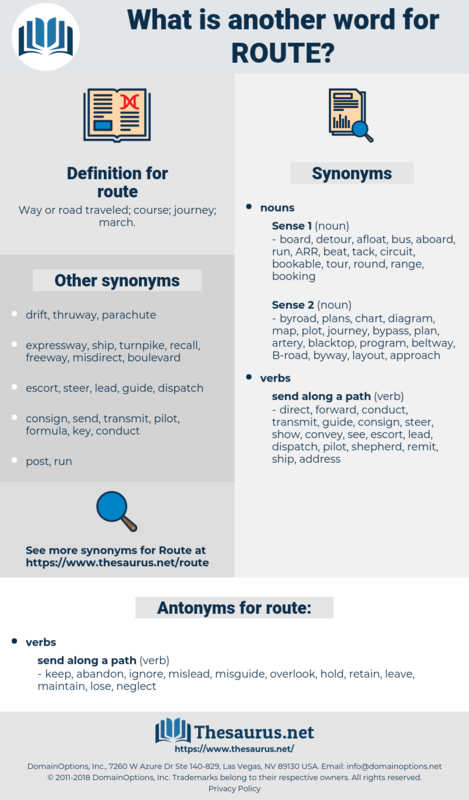 trajectory, thoroughfare, itinerary, router, stretch, tour, trailhead, demarcation, passageway, conduit, haul. keep, abandon, ignore, mislead, misguide, overlook, hold, retain, leave, maintain, lose, neglect. They had to go through doors, some locked, some open, following a different route from that taken by Euphra on a former occasion. All is ready; my horse has rested for two days; at least we can get some distance on our route. reata, rowdy, 3rd, rout, ready, red, red-eye, readout, routt, ratio, rat-tat, raita, 23rd, ruta, redwood, rotate, reid, red tide, rude, rooted, rudd, ride out, rote, rota, rutted, rood, rete, riyadh, redeye, radiate, reword, rutty, radio, rid, red haw, reit, read, ratitae, redhead, rawhide, rad, ride, rate, 33rd, roadway, ret, RHD, raw data, rarity, red hot, ruddy, rite, rod, rit., root, read-out, reward, red-hot, rat-a-tat-tat, riata, rheidae, red tai, raw wood, ratty, rotted, rewrite, rat, reread, rout out, ruth, 43rd, ride away, rotated, rut, riot, ratite, reheat, Rede, roth, reed, rat-a-tat, redheaded, retie, rearward, reedy, root out, redo, raid, rodeo, ready-to-eat, road, rot, rare earth, red heat. direct, dispatch, despatch, divert, send off, send.